Habit: Perennial herb, mat-forming, 10--20 cm, +- glabrous to sparsely glandular-hairy, gray-green; taproot > 3 mm diam; trailing stems or stolons 6--20+ cm. Stem: in flower +- erect. Leaf: 5--9 mm, 0.5--0.9 mm wide, often < internodes, needle-like, +- straight, rigid; axillary leaves weakly developed. Flower: sepals 3.5--4.8 mm, narrowly acute to acuminate, margin not incurved, veins 1--3, faint in flower; petals 1.6--1.8 × sepals. Seed: 2--2.4 mm; margin thick, red-brown to brown. 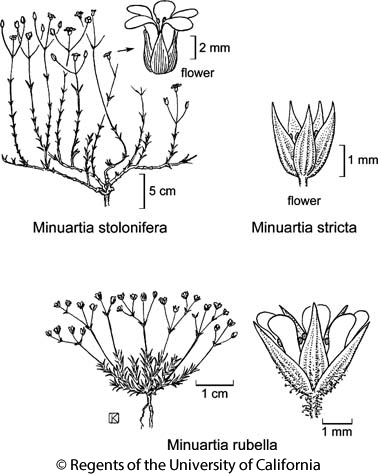 Citation for this treatment: Ronald L. Hartman & Richard K. Rabeler 2012, Minuartia stolonifera, in Jepson Flora Project (eds.) Jepson eFlora, http://ucjeps.berkeley.edu/eflora/eflora_display.php?tid=33772, accessed on April 22, 2019.
s KR (Scott Mtn, Siskiyou Co.). Markers link to CCH specimen records. Yellow markers indicate records that may provide evidence for eFlora range revision or may have georeferencing or identification issues. Purple markers indicate specimens collected from a garden, greenhouse, or other non-wild location.